A delicious, light and fruity cupcake from Martha Stewart's Cupcakes. I cut the recipe in half and it made 16 cupcakes. 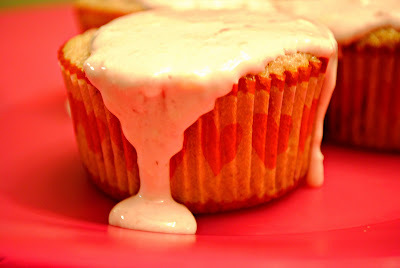 The cupcakes were moist and full of strawberry chunks. I did use the suggested strawberry meringue buttercream recipe but it left a lot to be desired and I don't recommend it. I ended up with more of a glaze than buttercream and while the flavor was good, it was not at all what I was hoping for, I attempted to fix the recipe by adding more powdered sugar but it never really came together so I didn't include the recipe below. I also used frozen strawberries instead of fresh strawberries, since its winter. I simply thawed them in the microwave for about 2 minutes until they were slightly softened, drained off the excess moisture and roughly chopped them. The recipe below is as I made it. Preheat oven to 350 degrees and line muffin pans with paper liners or spray with baking spray. Combine flours, baking powder, and salt and sift together. In mixing bowl, cream butter, sugar and vanilla until light and fluffy, about 2 minutes on medium-high speed. Add in eggs, one at a time, mixing for about 1 minute after each incorporation, scraping sides of bowl as necessary. Add flour mixture and milk, alternating with flour first and last. Beat until well combined on low speed. 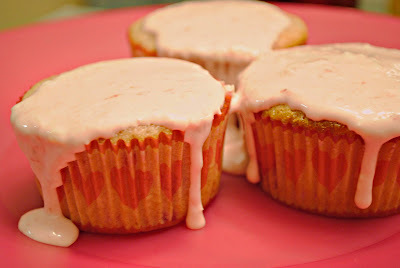 Fold in strawberry mixture with a rubber spatula. Fill each muffin cup about 3/4 of the way full and bake until set about 25-30 minutes. Bake on center rack and rotate pans halfway through baking time. Tops should spring back when lightly pressed. Cool in pan about 10 minutes and then cool completely on wire racks. Finish with icing of choice.